Overview - In 1997, shocking news reaches retired Mossad secret agents Rachel and Stefan about their former colleague David. All three have been venerated for decades by their country because of the mission that they undertook back in 1966, when the trio tracked down Nazi war criminal Vogel in East Berlin. At great risk, and at considerable personal cost, the team's mission was accomplished - or was it? The suspense builds in and across two different time periods, with startling action and surprising revelations. Despite our best efforts, it seems the sins of the past almost always have a way of catching up with us. Transgressions long thought dead and buried continue to haunt the present and as guilt and shame take their inevitable toll, the only solution becomes an attempt at redemption. Such is the case in John Madden's 'The Debt,' a psychologically fueled espionage thriller that deals with the costly effects of decades-spanning lies and deceit. Featuring interesting character work and exciting drama, the film succeeds at being both suspenseful and emotionally resonant, weaving an intelligent Cold War era morality tale seeped in murky gray hues. Based on the 2007 Israeli film of the same name, the plot jumps around between two distinct time periods. The majority of the story takes place in 1966 and focuses on three Mossad agents, David (Sam Worthington), Rachel (Jessica Chastain) and Stephan (Marton Csokas), as they are charged with tracking down a Nazi war criminal living in East Berlin. When the mission doesn't go as planned, the team is forced to make a drastic decision that could potentially hold dire ramifications. This leads us into the 1990s, when thirty years later the trio -- now played by Ciaran Hinds, Helen Mirren and Tom Wilkinson -- must finally face the consequences of their past actions. The script does a nice job of juggling suspense, emotion, and action. Portions of the film take on a classic spy thriller tone, and director John Madden effectively evokes the style of similar past works like 'Army of Shadows,' 'The Spy Who Came in from the Cold,' and more recent efforts like 'Munich,' with a tight pace and subdued, gloomy aesthetic. Bursts of action and excitement punctuate long stretches of quiet interactions among the team as the group starts to bond together in their close living conditions. This leads to a love triangle between the trio which serves as one of the major emotional and dramatic cores of the plot. While the film is home to some pulse pounding set pieces, the majority of the movie's tension is actually rather internal. In fact, a certain portion of the running time almost becomes a psychological chamber piece of sorts, that deals with escalating strain among the group as a captured Nazi scientist attempts to manipulate the team by playing their emotions against each other. Though these scenes do feel a bit familiar, this examination of the captor/captive relationship is handled well and becomes one of the most interesting aspects of the story. As the narrative progresses, the real thematic meat of the plot ends up focusing on the internal and external consequences of lies and deceit. Gradually the truth reveals itself and each character deals with the ramifications of their choices in different ways, presenting a fairly well rounded rumination on guilt and possible redemption. Both sets of performers do a very solid job in their roles, though it's really Helen Mirren and especially Jessica Chastain who end up carrying the picture. As Rachel, both actresses do a phenomenal job and effectively portray all of the complicated emotions and moral dilemmas that the character is forced to face. Chastain, in particular, manages to maintain a level of vulnerability while still coming across as a legitimate physical threat. Though he's a perfectly fine action star, I've yet to be terribly impressed by Sam Worthington as an actor. At times he comes across as nothing more than a blank slate, but thankfully, as the young David he does a solid job of expressing the character's restrained rage and increasing guilt. With that said, whether he's speaking in English, German, or Na'vi the Australian performer always seems to have a hard time masking his native accent. Though there is little resemblance between the two, the always reliable Ciaran Hinds is perfectly fine as the elder version of David and expands upon similar, disgrace ridden emotional beats. The character of Stephan is the most underdeveloped and unlikeable of the group and unfortunately despite good performances from Tom Wilkinson and Marton Csokas, he often comes across as one dimensional. While the film as a whole is certainly satisfying, there are some shortcomings. The flashback structure is interesting, but with so much of the running time dedicated to the 1960s storyline, the 1990s plot feels a little rushed and undercooked. Mirren's portions of the story are strong, but Hinds and Wilkinson are mostly marginalized. While all three of these performers are very talented, the dynamics that develop between the 1960s versions of their characters are so compelling that when the movie finally transitions back to the later time period one ends up missing the Cold War era setting and actors. Certain revelations and twists aren't quite as profound as their presentations seems to imply, and in the end, despite some strong themes and character work, this is a fairly basic and predictable story that doesn't do much to distinguish itself form previous entries in the genre. 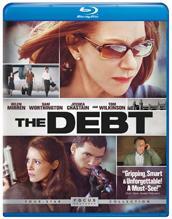 'The Debt' is a thrilling psychological spy drama that features a nice mixture of action and suspense. As its characters reveal, one can only go so long before the burden of living a lie grows too heavy to bear. Though the flashback structure isn't as effective as it could have been and certain plot elements are a bit familiar and unoriginal, the strong cast and deep themes overcome any minor flaws. It may not be as memorable or stirring as other European-set spy thrillers like the aforementioned 'Munich,' 'Army of Shadows,' and 'The Spy Who Came in from the Cold,' but fans of those films and similar efforts should not hesitate to check this out. 'The Debt' is brought to Blu-ray by Universal on a single BD-50 disc housed in a keepcase. Some skippable trailers play upon startup before transitioning to a standard menu. The movie is provided with a 1080p/VC-1 transfer in the 2.40:1 aspect ratio. Featuring a deliberately stylized look, the film looks quite good on Blu-ray, with only a small hiccup here and there. The source is in pristine shape with a light layer of nicely textured grain visible throughout. Detail is good and there is a solid level of dimension to the picture. With that said, several shots do exhibit a comparatively soft quality. Colors veer toward an intentionally subdued palette that seems to favor various blue, gray and green hues depending on the scene. While this doesn't exactly lead to a very vibrant image, the dreary, subdued colors work perfectly with the Cold War era content of the story. Whites are frequently overexposed, leading to blown out contrast levels, but again this aesthetic fits well with the tone of the movie. Unfortunately, the only real drawback to the video presentation involves some noticeably elevated black levels. Many scenes throughout the film feature black levels that appear rather gray and very rarely deliver a nice inky quality. While I certainly don't want shadow detail to be crushed, the relatively light blacks do lead to a somewhat washed out appearance in nighttime scenes. 'The Debt' features a fairly strong video transfer that offers decent clarity and an intentionally stylized palette that meshes well with the subject matter. Though black levels are not ideal, the picture as a whole is certainly pleasing and is thankfully free of any unnecessary digital manipulation or compression artifacts. The movie is presented with an English DTS-HD Master Audio 5.1 track and optional English SDH, French, and Spanish subtitles. With some inventive sound design that blends subtle and aggressive effects, this is a very solid track. Dialogue is crisp and despite characters' tendencies to whisper, speech is always audible and easy to understand. Directional and ambient effects fill a wide and spacious soundscape in both subtle and deliberate ways, creating a rich aural atmosphere. Dynamic range is wide allowing tiny sounds like dripping water to become important auditory motifs while still giving the film's few bombastic moments ample strength. Though the movie as a whole is actually very quiet, sporadic action scenes and shootouts offer solid surround use with whizzing bullets and zooming cars hitting the rear speakers. Bass activity has some powerful kick with gunshots and rumbling trains. Balance between the tense score, dialogue and effects is handled well. While not exactly demo material, the mix presents a nice mixture of quiet and loud design work, giving the film's gentler and more exciting moments equal artistic weight. Universal has provided a small collection of supplements including a commentary and three very brief and unfortunately useless featurettes. All of the special features are presented in 1080p with Dolby Digital 2.0 sound and optional English SDH, Spanish and French subtitles. Commentary with Director John Madden and Producer Kris Thykier - Madden and Thykier are pretty much all business during this very standard track. Various bits involving casting, locations, stunts, the history of the time period depicted and details on some of the trickier shots are discussed. Unfortunately, most of the commentary is simply spent with the participants elaborating on the film's plot and the psychology of the characters. While some of these observations are worthwhile the majority aren’t terribly insightful. Big fans of the film might want to take a listen, but most will probably find little to gain from this dry and dull track. A Look Inside The Debt (HD, 3 min) – This is a very brief and fluffy promotional piece that features some cast and crew interviews. Information on the movie's story, characters and structure are touched upon but most of this short featurette is really just clips from the film, making this a pretty useless inclusion. Every Secret has a Price: Helen Mirren in The Debt (HD, 3 min) – Like the previous featurette, this is a short promo piece. The focus is on how amazing Helen Mirren is with various participants gushing about her. Again, a lot of the material here is just clips from the movie. The Berlin Affair: The Triangle at the Center of The Debt (HD, 2 min) – More clips from the film and superficial comments from the cast and crew are included, this time dealing with the movie's central love triangle. 'The Debt' is an exciting and psychologically dense espionage thriller. With a strong ensemble and weighty thematic material, the film weaves an interesting tale of guilt and redemption that overcomes some small narrative flaws. Video and audio quality are both very good, providing a technically and artistically strong presentation. Unfortunately, supplements are slim and mostly superficial. Still, this is a solid disc, one that comes recommended.